We offer a wide selection of ophthalmic lenses for your glasses that come in a variety of designs and materials to accommodate any prescription; including Eyeland EyeDoc Signature High Definition Lenses and designs from the renowned laboratories of Varilux and Carl Zeiss. Eyeland EyeDoc On-Site Laboratories stock a full selection of lenses FULLY COVERED BY INSURANCE PLANS as well as reasonable options for upgrades from your basic insurance coverage. At Eyeland EyeDoc we fabricate your eyeglasses at our On-Site Optical Laboratories in both Hilo and Kona insuring start to finish full-service under our doctors' supervision every step of the way. Only one prescription covers the entire lens. People under 40 years old usually require this lens style to see both Far or Near at the same time. People over age 40 years old usually require this lens style to see either Far, or Intermediate, or Near (must choose only one viewing distance at a time when ordering the prescription for these glasses). Standard lens usually covered by most insurance plans. - Near Vision Only reading glasses. - Far Vision Only such as TV and driving glasses. - Intermediate Vision Only such as computer or hobby glasses. *Over 40 years old must choose either Near Vision Only or Far Vision Only or Intermediate Vision Only when ordering this lens style. Sometimes called "Flat-Top Bifocals". Two separate prescriptions cover different parts of the same lens with a visible line. People over 40 years old may use this lens to see both Far and Near. 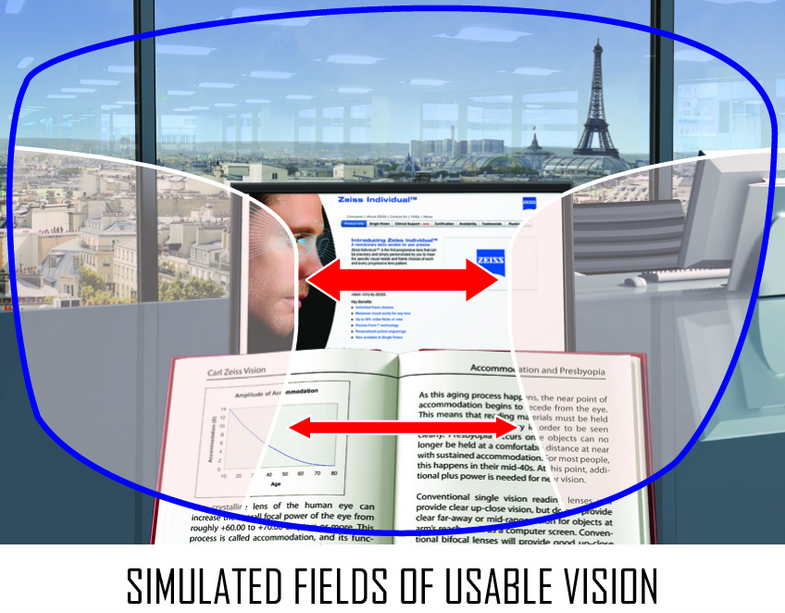 *Can also be used as computer station glasses by using a modified prescription for Intermediate Vision in the upper lens and Near Vision in the lower lens. Best if paired with an anti-reflective coating in this configuration (see below). No-Line High Definition Digital Progressive Lenses have many prescriptions that smoothly cover the entire lens. There are many points of focus without any visible lines. Premium lens usually partially covered by most insurance plans with an additional co-pay. Top of the lens- a large upper zone used for Far Vision. Center of the lens- a progressive increase in magnification prescription for a seamless transition from Far Vision to Intermediate Vision down to Near Vision. Botom of the lens- a large lower zone used for Near Vision. At Eyeland EyeDoc we use Digital High Definition free form progressive lenses. The advantage of using this newest technology in lens design is that you will have least peripheral distortion with a wide corridor of vision assuring sharp vision in high definition with a smooth seamless no-line transition at all points of focus. This technology will make it easier to get used to your new custom-made glasses than the old technology standard progressives that are commonly used at most other opticals. Lens Materials Comparison Chart We can make your lenses thinner and lighter weight by changing the type of material we use to make them. This chart shows horizontal rows of the same Rx made with different materials so you can see how thickness and weight will differ (thickest/heaviest on left and thinnest/lightest on right). At our opticals we will recommend the best options based on your Rx, frame choice, and budget. Lens Index on this chart goes in Horizontal rows with thickest/HEAVIEST material on the Left to Thinnest/LIGHTEST on the Right for each Rx Power shown written on the sides. Safer and lighter weight than old-fashioned glass lenses, superior optical qualities, and low price. - Superior optics for good vision. - Tints well for Sunglasses. Sometimes nick-named "Bullet proof" lenses, they were originally developed for use with Air Force flight helmet visors due to the durable and light weight maleability of this material. Thinner, Lighter, and more impact-resistant that standard plastic CR39 lenses. Normally required for safety in children or patients with decreased vision or only one fully functioning eye. Premium safety lens usually fully covered for children by most insurance plans and requires an additional co-pay for most others. - 26% thinner than Standard Plastic CR39 Lenses. - 30% lighter weight than Standard Plastic CR39 Lenses. - Impact resistant lens for improved safety. - Ideal for stronger prescriptions and safety glasses. Thin and light weight with greatest optical qualities. - 33% thinner than Standard Plastic CR39 Lenses. - 26% lighter weight than Standard Plastic CR39 Lenses. -Best when combined with an Anti-Reflective Coating (see lens coatings section below). Thinnest and lightest weight with greatest optical qualities. - 40% thinner than Standard Plastic CR39 Lenses. Offers protection from harmful ultraviolet UVA and UVB solar radiation rays that cause cataracts, retinal damage, and other vision problems in the eyes. Hard outer shell coating on the surface of the lenses to minimize scratching, chipping, breakage, and offering improved durability and extended life span longevity of lenses. Carl Zeiss Premium hydrophobic Anti-Reflective Coatings with DuraVision Blue Light Technology have the best resistance to smudges and eliminate glare by up to 90% to offer best performance for Blue Light and Digital Device Screens. This reduces glare and visual fatigue to improve night driving and computer vision by 10% or more. Highly recommended for patients with lasik, cataracts, macular degeneration, retinal disease, computer use, video games, watching TV, work under fluorescent or LED lights, reading with overhead or window lighting, night driving, and night time glare. Most situations will result in improved vision and greater visual comfort when using these premium Anti-Reflective Coatings. Use these coatings with high index lenses for enhanced optics with greatest quality vision offered. Light tint for Day and Night use, Solid or Gradient Fashion tinting, Amber driving and shooting sports tinting, Fashion Sunglass tinting, etc. Photochromic lenses darken when exposed to UV light from the sun to protect your eyes from harmful UVA and UVB Rays. Eyewear designers Coco & Breezy share their story and how Transitions® adaptive lenses™ help them find inspiration everywhere they look. Best option for sunglasses in Hawai`i, the tropics, and also for use in snow, this treatment reduces glare from all shiny surfaces like the ocean, standing water, glass, snow, metal, chrome, and asphalt providing excellent sun protection and superior visual comfort for all outdoor activities while reducing excess glare. Best if paired with a backside Anti-Reflective Coating (see lens coatings section above). Mirror coatings protect against bright sunlight and glare while showcasing a variety of fashionable color options that give absolute privacy to the wearer and ideal for use in sunglasses. Additional coating options such as Flash Mirror Colors, backside Anti-Reflective Coating, Gradient Polarized Tinting, and Varied Colors are available for special requests and custom orders.